Regression is a machine learning technology used to predict a response variable given multiple predictor variables or features. The main distinction is that the response to be predicted is any real value and not just any class or cluster name. Hence though similar to Classification in terms of making a prediction, it is largely different given what it’s predicting. Sale_price = square_footage * price_per_sq_ft + some_base_price. It is the task of the algorithm to find the values of the “price_per_sq_ft” and “some_base_price” that best fit the given data. Such a form of regression is termed as Linear Regression, simply because the response variable is “assumed” to be a linear combination of the multiple input predictor variables. Although linear regression is simple to understand and implement, it has it’s own set of limitations. The limitation lies in the assumption made by linear regression. 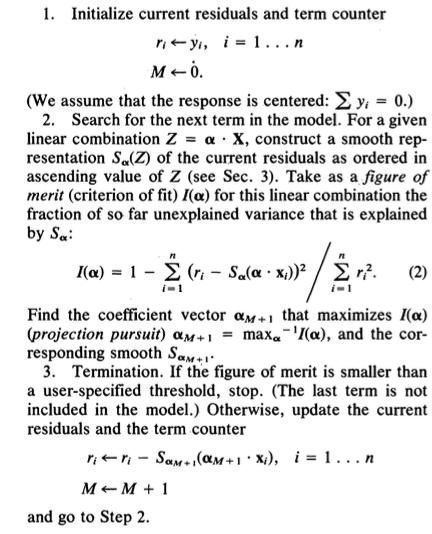 It assumes the function of the regression surface to be a direct linear combination of the predictor variables. While it greatly reduces the task to just finding the correct coefficients (or weights or parameters), it bears the cost of inaccurate predictions. Projection Pursuit Regression (PPR) is a non parametric regression algorithm used exactly to overcome this limitation. PPR starts with a more general assumption for the regression surface to be found. It then refines the assumption in successive iterations and simultaneously also finds the parameters that fit best. PPR is more suitable for getting accurate predictions in real world prediction problems where the nature of regression surface, though unknown, is at least definitely not linear. The regression surface is generally assumed as a linear combination (sum) of empirically determined functions (denoted by S) of the predictor variables (X), as shown below. In the first step, we initialise “residual” to given response variable (y), and the term counter M to 0. In the last step, first the value of figure of merit is checked. If less than a certain given threshold, the last term is removed from the model and the algorithm terminated. Else, the residuals are updated by subtracting the prediction made by the latest term. Conceptually, “residual” thus means the residue from the original response y, which is still not predicted by the terms already found by the algorithm. 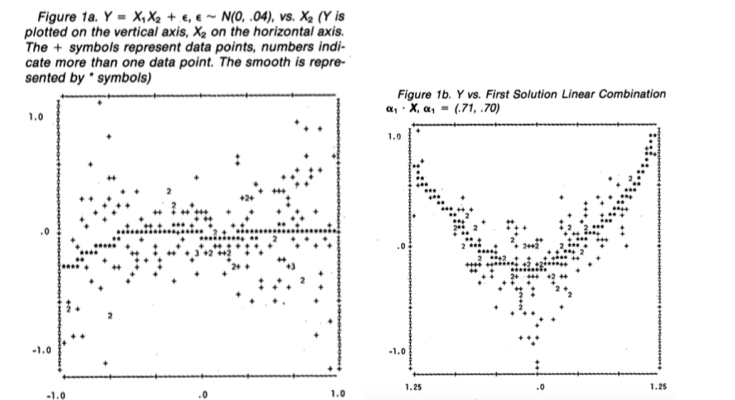 An important part of the algorithm is determining the function S which is commonly known as the smooth function. Smoothing technique in most basic terms finds a function which fits a set of data points. It does so by finding more potential points which may fit the function. These new points are found by taking an average of already existing neighbour points. All traditional smoothing algorithms consider a uniform bandwidth throughout. However, in this paper, they have implemented a variable bandwidth smoothing. It uses an average bandwidth value provided by the user. Based on response variability estimates, the actual bandwidth used is larger or smaller than the given value. The response variance provides an estimate as to how “close” the response variables are. If there is a tight cluster of response variables, the bandwidth used for smoothing there would be larger and vice versa. The paper exhibits the working of the algorithm with a couple of example datasets. The following figures give a graphical interpretation of the steps of the PPR algorithm. Figure 1a: Initial plot of Y v/s X2 shows that the smooth (denoted by *) hardly fits the data points (denoted by +). Hence Y is certainly not just directly proportional to X1 or X2 alone. Figure 1d: This plot shows residual from previous round v/s S3(alpha3. X). Since it’s not a good fit, this term is discarded. Mathematically too, in this iteration the figure of merit I(alpha) is less than the pre-decided threshold and the algorithm is terminated. Following were the plots obtained for the 3 iterations of the PPR algorithm. 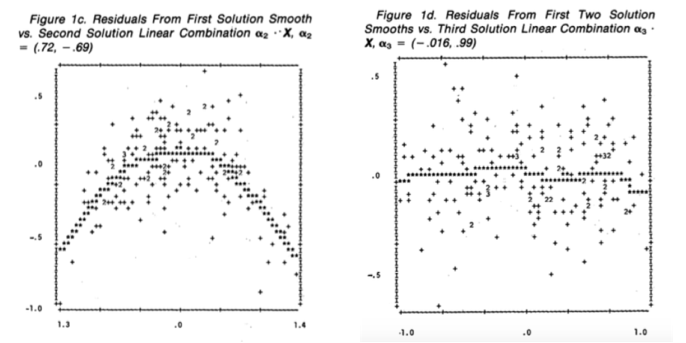 All three plots show the smooth to be a reasonable fit, and the regression surface is the combination of all the smooth function terms. Backfitting: Readjustment of the smooths along previously determined linear combinations when a new linear combination is found. This is a slightly more refined addition to the PPR algorithm. Projection Selection: Restrict the search for solution directions to the set of predictors. Thus instead of having all the predictor variables in each term, restrict it to the set of variables having highest contribution in that direction. For instance, in the second example above, perform smoothing only for X1 , X4 and X5 respectively in the three iterations. One can also use a combination of Projection selection and Projection pursuit. As seen in examples, PPR can represent each iteration graphically, thus facilitating interpretation. Such output can be used to adjust main parameters of the procedure: average smoother bandwidth and termination threshold. Projection Pursuit Regression is certainly more general in it’s assumptions and hence tends to give better approximations of the regression surface. It can surely be used as an approach for the real world datasets where there is a possibility that linear regression will fail because of the restricting assumptions.